Moroccanoil Moisture Repair Conditioner gently detangles and reconstructs hair while infusing it with argan oil, keratin, fatty acids and protein. For hundreds of years Argan oil has been used by women in Morocco to treat hair and nails in order to counteract the effects of the hot climate. The Argan tree, found only in the South West of Morocco called Argana; blossoms in the desert-like conditions and produces fruits much like olives yet larger and rounder. Inside the fruit grows a large nut that houses up to three almond-shape kernels which are the source of this miraculous oil. 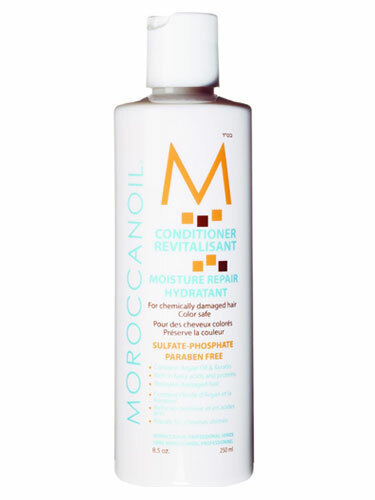 After cleansing with Moroccan Oil Moisture Repair Shampoo, gently squeeze excess water from hair and apply conditioner from scalp to ends. Leave on 1-2 minutes. Rinse well. Avoid contact with eyes.